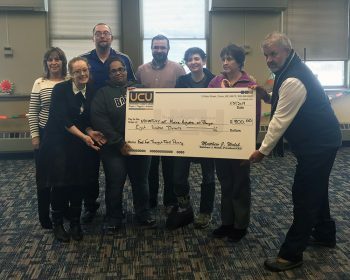 University Credit Union (UCU) presented checks to the University of Maine at Augusta (UMA) totaling $2,422.00 for the student-run food pantries on UMA’s Augusta and Bangor campuses. 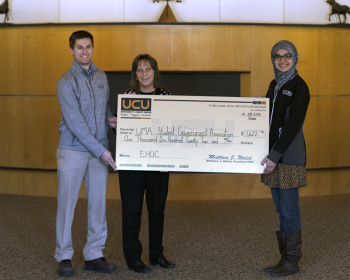 The Augusta Campus check of $1,622.00 was presented to Fatimah Aleem, UMA’s Student Government Association President for its student-run campus food pantry, the Community Cupboard. A check in the amount of $800.00 was presented to Food for Thought Student Coordinator Nicole Roberts for the student-run Bangor Campus Food for Thought pantry. Through its Ending Hunger on Campus in Maine campaign, UCU raised $12,559.81 in donations for University of Maine System student-organized and campus-sanctioned food pantries. UCU matched this amount for a total donation of $25,119.62 to eight food pantries on campuses within the University of Maine System. This marked the second year of UCU’s Ending Hunger on Campus in Maine campaign “to bring attention to student food insecurity in Maine and to recognize student food pantries for tackling the problem head-on.” From November 26 to December 31, 2018, community members were encouraged to donate online through UCU’s website, or by stopping by or mailing a check to any UCU branch. Donors could choose to specify a campus food pantry and non-designated contributions were distributed among the eight pantries. The donations from UCU will allow the Community Cupboard and the Food For Thought pantry to supplement their offerings. Current supplies are obtained through funding from the Hunger Dialogue Grant, as well as SGA funds allocated to the Community Cupboard and in-kind and monetary donations to the Food for Thought pantry. Pictured from left to right: Mike Connors – UCU Marketing Specialist; Catherine Philbrick – UCU Branch Manager in Bangor; Fatimah Aleem – President of UMA’s Student Government Association. Pictured from left to right: Catherine Philbrick – UCU Branch Manager in Bangor; Colleen Coffey – UMA Learning Success Coach; Kent Corey – UMA Coordinator of Student Life-Student Activities, SGA & Leadership Development; Nicole Roberts – Food for Thought Student Coordinator; Derek Hebert – UCU Branch Manager in Orono; Kati Corlew – UMA Social Sciences Faculty and Co-coordinator of the Office of Civic Engagement; Lori Googins – UMA Coordinator of Student Life-Wellness & Cultural Enrichment; Robert Roper – Interim UMA Bangor Campus Dean & Professor of Business Administration.